In an 'FT' blog entitled "Ukraine says Tymoshenko an ‘irritant’ to EU ties" Ukraine’s foreign minister, Kostyantyn Gryshchenko, today acknowledged that the former prime minister had become more of a problem for his government in jail than free, noting her imprisonment has made an “association agreement” with EU almost impossible to finalise. “We [see] this issue as a certain irritant which obviously is not helping to move ahead with a positive agenda with the European Union." Foreign Minister Gryshchenko admits: ".. for the last 20 years almost every government official at the highest level presumed that they would never be asked to answer questions about their actions that were contradicting the law." These actions by 'almost every government official that were contradicting the law' were almost always taken for self-enrichment. Most of Gryshchenko's current cabinet colleagues, the current President, and members of his administration have held high office for many years in previous governments. Why aren't any them facing charges? By charging and sentencing only their most feared opponents: former PM Yulia Tymoshenko and former Interior Minister Yuriy Lutsenko, accusations of selective justice will inevitably be made against today's authorities. Ukraine's leaders remain amongst the most corrupt in Europe. Party of Regions' parliamentary deputy Vladislav Lukyanov [see picture] has bragged on his facebook page how he drove the 440 km between Kyiv and Odesa in 2 hours 40 minutes - despite a blanket 110 km/hour speed limit. He even posted a photograph with the speedometer of his Audi A8 showing 241 km/hour as he was driving. He can do this because of he is protected from prosecution by parliamentary immunity. What a complete and idiot... what a complete a***hole. Lukyanov is a high-profile politician, frequently seen in the mass media...always available for a comment - particularly to rubbish the opposition. Could there a better example of mindless arrogant behaviour to demonstrate what kind of morons run the country..
p.s. Ukraine has one of the highest traffic-related death rates in Europe. E.g. about 5 times as many people are killed on the roads per capita per annum, than in the United Kingdom, where there is a blanket 70 miles per hour [112 km.hr] speed limit on motorways. There are, astonishingly, over 20 times as many road fatalities per 100,000 vehicles in Ukraine, that in the UK, per annum. "State Tax Service: Criminal case opened against TVi director over evasion of payment of Hr 3 million in taxes"
"Prosecutor's office opens criminal case against LB.ua on violation based on Landik's claims"
The Lb.ua site has been erratic today - at time of posting all that is being displayed is 'temna makhorka' i.e. head of president's administration Lyovochkin - deputy prosecutor-general Kuzmin - vice PM Khoroshkovsky - presidential judicial system adviser Portnov..
cf: "Yanukovych calls on local authorities to ensure election campaign is fair"
Khoroshkovsky has now publicly distanced himself from the attack on Lb.ua....But he has has certainly directed heavy fire onto TVi in the past. Could this be just a sign of an internal feud inside the party of power... or are these two cases examples of simple personal vindictiveness, or part of a wider attack on the media? Update: Prominent journalist Mustafa Nayem places the blame for this attack against press freedom firmly at Yanukovych's door. Lb.ua's chief editor Sonya Koshkina, in comments on her publication's site is more cautious and hints 'el presidente' may be above the fray - perhaps to provide some 'wiggle room' for an honourable backdown...but she does say: "The scale of the persecution means no one has any doubt: the joking has long finished, this war is a matter of life and death and they've gone for us seriously... I assume many would be pleased to see me on the scaffold..."
Update 2: "The president is concerned about the recent events around the Ukrainian media" including those surrounding LB.ua and TVi, according to the official presidential site.. But 'the evil empire' will already be plotting it's revenge for this humiliation..
Ukraine's only independent TV channel, which, i.m.o. employs some of the country's best journalists, has been under attack by the Ukrainian tax authorities for many weeks. Yanukovych and his son have a total grip on the levers of power. The head of the state tax service Klimenko, the head of the ministry of interior Zakharchenko, head of state security [SBU], Kalinin, and prosecutor general's office top knobs Pshonka and Kuzmin are 100% Yanukovych loyalists. They are shamelessly conducting an assault on independent media in the country in order to neutralise them before the next parliamentary elections. A trumped up tax evasion criminal case has now been opened against one of TVi's most prominent front-men and general director, Mykola Knyazhytsky, He has responded in an open letter to the president published on 'Ukrainska Pravda' site. All this despite the Ukrainian State Tax Service's announcement on March 30th this year on its website, that it will not be conducting any tax checks on the mass media in the second quarter of the current year in order to provide them with "all the [necessary] conditions for objective illumination of the [October parliamentary] election campaign"
A few days ago I blogged about the disgraceful attack on the independent LB.ua website which has driven its top journalist to seek refuge abroad until she receives an undertaking that the absurd case against her and the site is dropped. Most television channels, newspapers and other mass media are controlled by wealthy oligarchic Party of Regions' supporters already - their news broadasts and current events programmes are heavily biassed. Tvi and Lb.ua are in a disadvantagous position..now they are being squeezed even harder. Kyiv Dynamo fans protested against the possible adoption of new laws which could enhance the status of so-called minority languages, including Russian, during Saturday's Dynamo vs Metallurg Donetsk soccer match. The banner reads: :Ukraine has 46 million tongues - but one language"
The fans lustily sang the national anthem of Ukraine..
P.S. However you look at it, Yanukovych was humiliated by Putin last Thursday. Medvedchuk, who was Kuchma's grey cardinal, sees Ukraine's future firmly in Russia's orbit. A man with Putin's St Petersburg KGB background will inevitably have a disdain for the likes of Yanukovych who was brought up in the rundown criminalised hinterland of Yenakiyeve and spent three and a half years in prison for violent crimes..
Serhiy Vlasenko, in his 'Kommersant' blog, posts details of a recent article from the authoritative Polish 'Gazeta Wyborcza.biz' site. The graphic below, from the article, shows the price in dollars per t.c.m. charged by Gazprom to countries in Europe for their gas. Legendary Soviet and Russian pop singer, long-time member of the Russian State Duma, Iosif Kobzon, attended a ceremony celebrating the 80th anniversary of Donetsk region where he was born and where he is revered. Kobzon was asked by a 'Novosti Donbassa' journalist for his opinion on the current Russian/Ukrainian language scandal. He did not understand why the status of Russian needed to be changed. "...who today gets in the way of anyone speaking in parliament in Russian? Who obstructs anyone speaking Russian in Donbas? And would anyone be surprised if any of you were to speak in Ukrainian? So, it's a contrived political conflict, which I hope, will be resolved without any particularly serious consequences", said the Russian singer. Also this on the Magnitsky case: "Calls on national parliaments to take action to impose visa sanctions and asset freezes on persons responsible for the false arrest, torture, denial of medical care and death of Sergei Magnitsky,.." Could cause some furrowed brows on Ukraine's mount Olympus..
PoR bulldozed the second reading of their language bill through parliament on Tuesday, trampling over procedural rules to force through this most controversial of policies. A host of voting irregularities took place - speaker Lytvyn is set to resign. PoR could have basked for a while in the afterglow of a reasonably successful Euro 2012 football competition. They have chosen not to do so and as a result have infuriated a large portion of the electorate. The new policy will become law if and when it is signed off by the president. The arrogance of his party colleagues has forced Yanukovych to now face what could be the greatest crisis of his presidency so far. The president faces an dilemma - but the damage has been done. Whether he and PoR back down or continue with this policy, this crisis could turn out to be the start of the turning of the political tide. The Euro 2012 football competition has ended. Despite some shortcomings, most Ukrainians across the land have experienced a genuine feelgood factor such events bring to a host country. When pushed they have shown they can deliver a world-standard event, (even if its pure financial benefits are a matter of conjecture). One blogger writes, the granting of half the tournament presented Ukraine with a challenge. These included strict closely monitored deadlines set by Europeans, which were successfully met by the country. The project could have been a fine template for any Euro-integrational plans. The British 'Independent' wishfully notes in a recent editorial: "With the successful Euro 2012 under its belt, Ukraine, it must now be hoped, will take another look at the state of its own politics and how it measures up to the Europe it still aspires to join. 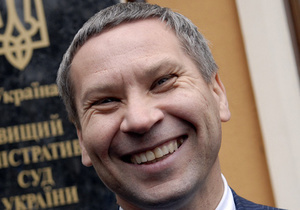 Reconsidering the prosecution and imprisonment of the former Prime Minister, Yulia Tymoshenko, must be part of that." Just watched Vitaliy Portnikov's latest 'Politklub' tv programme on-line about the ever-increasing difficulties being faced by Ukraine's small and medium-sized businesses and traders as they are, to an ever-greater degree, being systematically squeezed by corrupt state officials, tax collectors and 'business raiders'. The atmosphere in the studio was sombre. Some called the process a second phase of 'oligarchization' of the country. These are the people on whom the future prosperity of the country to a great extent depends. The small-scale entrepreneurs taking part in the programme feel very badly let down by Party of Regions and the president - they are at the end of their tether. You get the feeling that if the October elections are significantly 'fiddled' their anger may well spill out onto the streets..